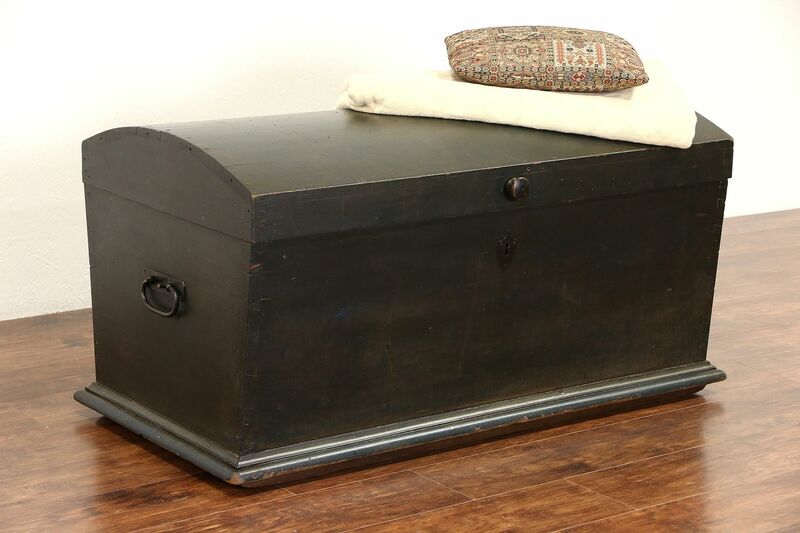 A "dome top" immigrant trunk or blanket chest was expertly hand crafted about 1840 in northern Europe. Solid pine and poplar have traces of old dark blue paint, preserved with a clear satiny finish. Corners have hand cut dovetail joints, every surface is hand planed and square wooden pegs instead of nails secure the joints. Inside is a lift out tray and small compartment for valuable. There is a scent of mothballs inside this antique furniture. Wrought iron hardware is original, the lock has no key. Size is 47" wide, 24" deep and 24" tall.